Some situations in life may not always turn out as you'd expect. 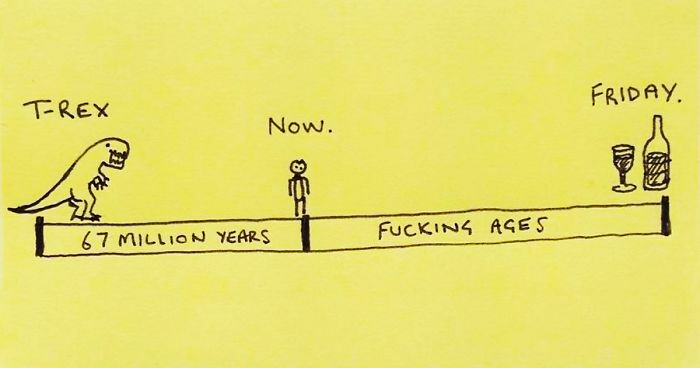 Illustrator and author of 'A Sticky Note Guide to Life', Chaz Huton, perfectly sums up the realities of everyday life, and he does it all on sticky notes! From dinner parties to being sick to starting a new job - Huton has illustrated it all in a simple yet brutally honest way. Check out some of his illustrations below and vote for your favorites! You can find more work by Hutton on Instagram or his new book, which can be purchased through Amazon. If you enjoyed this article, also check out Huton's hilarious illustrations that perfectly sum up adulthood. The 2nd one is so accurate. I live on the 4th floor in my apt building, and I will carry 12 bags, and risk cutting of circulation to my hands, before making a 2nd trip back out to my car! They only underestimated that cats had the same idea. Do the 'burrito method' and you can wrap yourself in a space time wormhole ...thingy. Caffeine: America's only celebrated addiction. Not accurate at all. The amount I actually eat should go up in the zone of regret, over the top of the note, and continue onto the desk. LMAO! This one is spot on!! As a tall chick, this is how I feel when I try on clothes! Needs "Temporary '5-year-max' house you mortgage just before housing market crashes, trapping you forever in a place you hate". Definitely sending this one to my fiance! Very accurate representation of my life. 100% me, but I know for sure I'd be a goner. I'm this guy and it's true and funny! Why aren't these buttons standard? I've seen a piece of art very similar to this in grade school. I remember thinking (and saying), "Who decides what is considered 'gallery worth'? This looks like something I made in kindergarten with construction paper, safety scissors, and a glue sick." I feel like dryer lint, are the ashes of the fallen socks we will never have matches for! Oh, I'm the one who only ever talks about Game of Thrones, except I don't just talk about Game of Thrones I talks about The Hobbit, Lord of the Rings, Sherlock, Game of Thrones, Harry Potter, Lost, etc. Me. Except I don't have a phone (yes, really.) so i'm fucked. Did this recently getting groceries. The circle on the left should be much smaller than the one on the right. The second one is also "When I need it most." Oh neat; the cycle of "doing something stupid and then doing it again after forgetting that it was stupid" is a saw wave. Guilty! And then I always feel awkward after having just jogged past them.. This looks so much like winnipeg. Even your location of IKEA being in the SW end out of reach unless you own a car and can afford gas. 12 would how Assiniboine Park USED to be but now it's like 15. 5 would be St. James St., or Main St. 14 Is St. Vital. 16 is West Broadway (hipsters and hippies). 9, 3 & 2 Osborne Village. I've gotten past this by telling myself If I get up and go now I won't spend the next 20-30 mins thinking about going. Before "Go to supermarket": "Make list". After "gts": "Realize you left list at home"
Ok why would you a movie with your new date's parents? Never say no to dessert! Nevaaaaar! I love how the wobbly lines make him look old. It's amazing how much detail some people can put into a stick figure. Subtle things make all the difference. Forgive my ignorance, what is BPD?